Classical Net Review - Coates - Quartets #1, 5 & 6 and Symphonies #1, 2, 4, 7, etc. 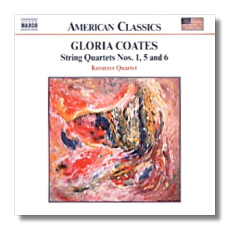 String Quartet #1 "Protestation Quartet"
A Michigan-born composer who has lived in Germany for most of the past thirty-some years, Gloria Coates (b. 1938) is practically unknown in the United States. She studied at Louisiana State and at Columbia, and her principal teachers were Otto Luening and Alexander Tcherepnin. Several years earlier, however, she won her first composition award at the age of twelve (or fourteen, depending on whose bio you read). She hasn't slowed down since, with more than a dozen symphonies and other works to her name. Writer Robert Burns Neveldine, whose interview with Coates (home.attbi.com/~neveldine/coatesinterview.html) is well worth reading, describes her music as characterized by its "glacial semitonal and modal shifts, clustered chord progressions, hair-raising glissandi, and nonredemptive climaxes." Sometimes her music – rich in glissandi and sonoristic effects - has been compared to Penderecki's early work, but Coates remarks that she arrived at her style independent of the so-called "Polish School." In the same interview, she is also quick to dismiss (far-fetched, I think) comparisons to minimalism. To my ears, she is one of those composers who bravely tries to free music from the tyranny of melody… or better, the tyrannical expectations of listeners who narrowly and unnecessarily define the boundaries between music and organized noise. In so doing, much of her music reminds of me of the early works of Kryszstof Penderecki and György Ligeti, and of the compositions of Sofia Gubaidulina, another woman composer who can really make the listener stop short with her unconventional and compelling sound-world. Coates's works might be called difficult and even frightening because she, like Charles Ives, is evidently uninterested in writing "nice" music. In the Neveldine interview, she comments," My music expresses my inner world. I am not aware of its being terrifying, although it does express very basic feelings of life and death and joy as well as anxiety and pain." Of the three discs listed above, I recommend starting with CPO 999392-2 because it contains what seems to have become Coates's signature work, her First Symphony, subtitled "Music on Open Strings." This symphony, which was completed in 1974, was not premièred until four years later at the Warsaw Autumn Festival, where it apparently created something of a sensation. Within a traditional four-movement structure, Coates turns the orchestra into a seething laboratory of sound. At the start of the symphony, the strings are tuned to the notes of the pentatonic scale, and they are tuned back to the traditional Western scale as the symphony progresses. The opening theme also is gradually transformed by a variety of playing techniques and styles. It is rare that music gives the listener the impression that it itself is a conscious, growing (albeit alien) life-form. Sibelius's Fifth Symphony does this, but so does Coates's First. On the same disc, the Fourth Symphony ("Chiaroscuro") is distinguished by the use of Dido's Lament from Purcell's Dido and Aeneas as a harmonic underpinning for the progress of the first movement. 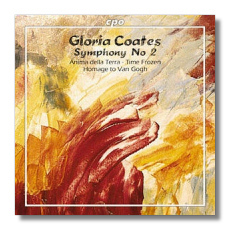 The Seventh Symphony ("Dedicated to those who brought down the Wall in PEACE"), specifically its last movement, highlights another common element of Coates's work, the string glissando. Used en masse and in layers, the sonorities which result are both ecstatic and terrifying – like ancient Greek drama. Coates's music does not seek to charm the ears (although it certainly intrigues them), but it does engage the emotions most powerfully. The second CPO disc is the logical next step for the provoked listener to take. By the time he or she gets to the Homage to Van Gogh, human voices seem to calling out from the middle of the orchestra. (When actual voices appear in Anima della Terra, the next work on the CD, the effect is galvanizing.) The Homage is based on Van Gogh's still life of quinces. The composer's explanation is telling: "[it was] not really a still life inasmuch as all the objects were in motion. Van Gogh painted it during the last year of his life, …, I felt something of his own fears and disappointments… and the quinces were beginning to move, one was already falling…." In Time Frozen, yet another of Coates's interests, the formal strictness of polyphonic counterpoint, is contrasted with her relentlessly experimental imagination. The Naxos disc, which was issued in May 2002, is the most recent Coates disc at this time. The traits exhibited in her orchestral works also appear in her string quartets. The dour, brief First Quartet comes from 1966, before Coates went to Germany. In this quartet, her fascination with canons and unusual string timbres is already evident. Here, Coates seems to be acknowledging Béla Bartók. The Fifth Quartet, written in the late 1980s, incorporates canons, glissandi, scordatura, and quotations of "Fling Out the Banner, Let It Wave" (also known as "I Heard the Bells on Christmas Day") – shades again of Charles Ives. The opening movement of the Sixth Quartet (1999) is designated "Still," and indeed, the music sounds almost autistic, even post-nuclear, and eerily so. The third movement, "Evanescence," recapitulates the first movement, but is even more still. In between, "Meditation" is a fragile web of glissandi. The music is devoid of melody, at least in the traditional sense, but it can grab the listener as tightly as any Big Tune, if given the chance. Although several different ensembles appear on these three discs, the performance standards are consistently high. Live performances on the CPO discs intensify the feeling of taut occasion. Each of the releases is made even more valuable by extensive booklet notes, although cpo's are not always translated into the most idiomatic English. Finally, each booklet cover reproduces one of Coates's own paintings. Yes, she's an artist too, and she wields a paintbrush much as she wields a composer's pen. 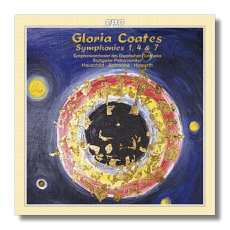 I give these three discs an enthusiastic recommendation and look forward to hearing more from Gloria Coates.